Any dish that ends with Datsi will have cheese in it. Emma Datshi, Asparagus Datshi, Sekum Datshi (pork), Sakum Datshi (beef). Any dish whose name ends with Maroo is a light stew which you can safely order as it's light and usually tasty. There are chicken, pork, beef and veggie variants. Any dish that ends with Paa is a fiery combination of local green leafy veggies and meat and big red chillies. Quite good if you like your food to be a little spicy. Order Red rice…it has a rich nutty flavor and will go well with most cheese based local dishes. You can also have white rice with corn. You will find a wide variety of them from rice to buckwheat to the Wai Wai and Koko brands. Try the spicy buckwheat noodles (Puta)…they have a different flavor. Apart from Alchol, you can choose to supplement your meal with hot water/ iced tea (lipton variants)/ Big Cola or Butter Tea (Suja). Do not expect Suja to taste like Indian version of tea… it's actually like salty/ sweet flavored light porridge. They even have Suja with paneer and eggs in it at some places. According to locals, drinking Suja prevents chapped lips and keeps the body warm. If you are travelling to Bhutan it's recommended to forget your branded liquor preferences and sample the lovely local selections of wine, whiskey, rum and vodka on offer. Liquor is surprisingly cheap and good quality here. 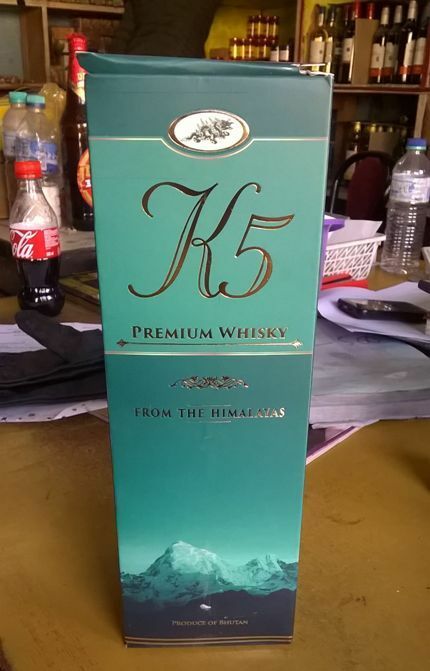 Incidentally, one of the things you should shop for while in Bhutan is local brands of alcohol. Most restaurants will serve these brands and almost every grocery shop sells the following. You can sample each and then choose to continue with your favorites like I did. Below are some of the alcoholic drinks I tried and purchased. I have mentioned the brand and price for each. Named after the King of Bhutan, this is Bhutan’s most popular and the best whiskey. Has a mellow flavor and combines malt from Scotland and spring water other than processed fine spirit. 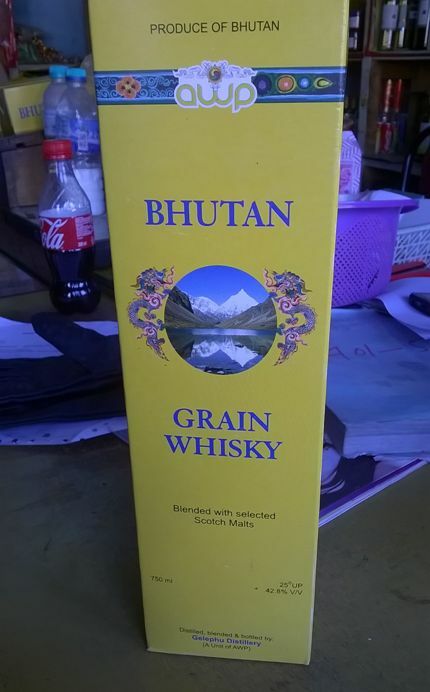 Produced in Gelephu distillery of Bhutan and very nicely blends selected Scotch malts. Another popular whiskeys of Bhutan produce include Black Mountain Whiskey 350 ml-130 NU. A local brandy known as Rock Bee Brandy 350 ml -100 NU is also popular here. Medium Acidic, richly flavored with sweet notes…the Takin Red wine is Highly recommended by locals. A good accompaniment to light salads and fruit bowls. 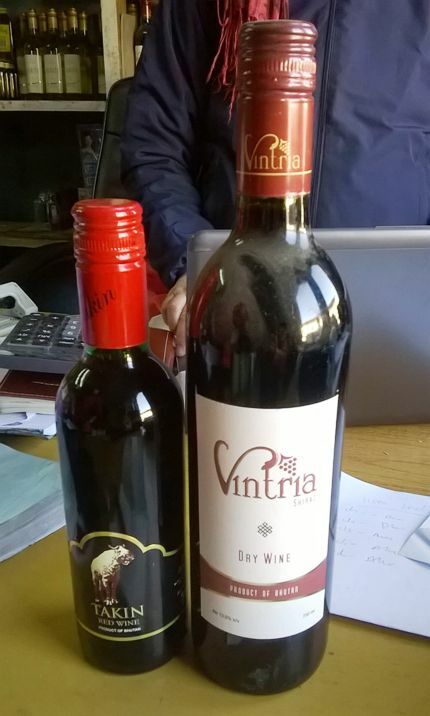 Vintria is a good choice if you are fond of light dry wines. 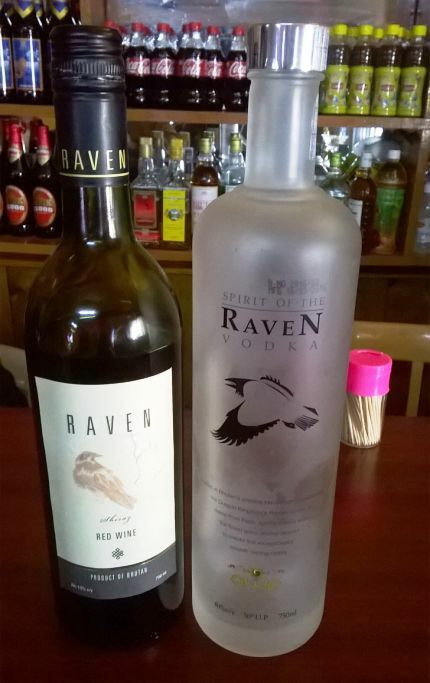 I tasted this Vodka in a Screwdriver and it was okay…Raven also has Red Wine which I didn’t sample. My personal favorite… loved the light fruity taste and carried two bottles back home. There is a SPY range of wine coolers that is basically a mixture of wine, mineral water and flavor. Tried the strawberry version and found it to be too sweet. Red and Black versions are also available. 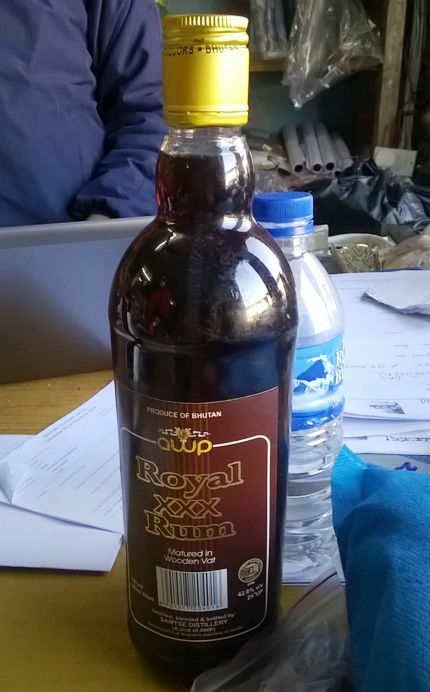 This is Bhutan’s local liquor made of fermented rice. Tastes like very strong SAKE and recommended for people who have experimental tastes. Hearty beer which is the Bhutanese staple drink during summers. 1) Dining & Wining in Paro - Get to know more about the local Bhutanese dishes and the best restaurants serving authentic Bhutanese cuisine. 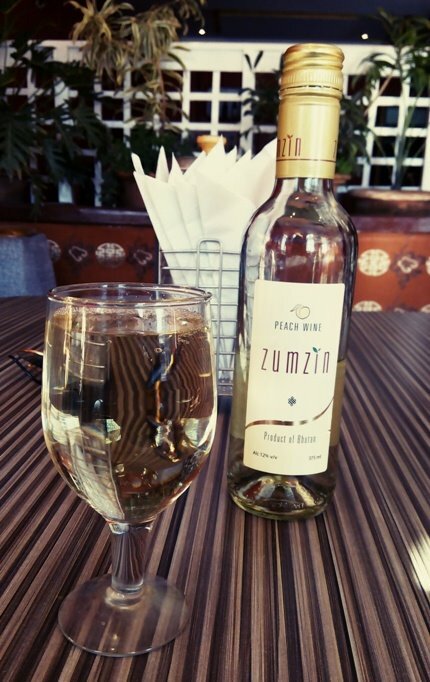 2) Dining & Wining in Thimphu - know about many budget, mid range & upscale restaurants in Thimphu as well as about great cafes, bars & nightclubs. Hi Mr. Raj we have visited Darjeeling 2016 June and got a ton of help from your details. Now my 3yrs old kids is fond of fish and specially with soft kind of rice he doesn't take anything apart from that. So please suggest whether we can have fish through out Bhutan or not as we have a plan for that place..
Chicken, beef and pork are much more common in Bhutan than fish. Many restaurants serve it but the produce is imported from China and India. You will get fresh trout and snow fish... These are cultured locally. Most kids love cheese... If your kid is one of them, Bhutan will be fun... They have a huge variety of cheese based dishes. Do ask the cook to tone down the use of red chilly in dishes if you do visit Bhutan.